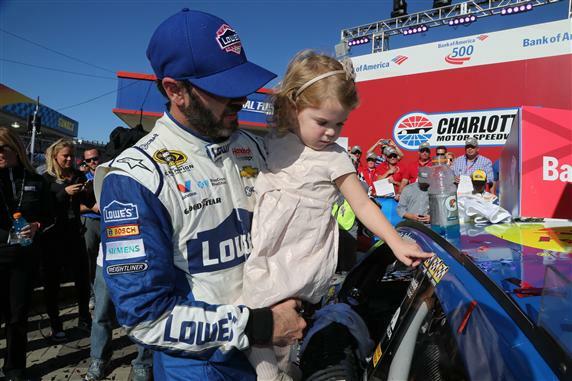 Jimmie Johnson celebrates victory at Charlotte with his daughter. CONCORD, N.C. – Jimmie Johnson is back to his winning ways. The Hendrick Motorsports driver captured the victory at Charlotte Motor Speedway, leading 155 laps along the way. The No. 48 outlasted Matt Kenseth’s No. 20 during the final stretch and emphasized his organization’s somewhat sudden surge of power since the Chase began. Johnson praised the day conditions for making the track easier to drive. Eight cautions marred the day, making restarts key moments. Johnson felt that the yellow flags fell the No. 48 team’s way once they gained track position. The race – which is typically run at night – took place Sunday afternoon due to weather conditions caused by Hurricane Matthew. This led to unintentional chaos, with multiple championship contenders dealing with a slew of problems. Electrical issues sidelined Kevin Harvick early on, while Joey Logano got into the wall twice. They finished 39th and 36th, respectively. Chase Elliott and Austin Dillon ended up in the garage after Martin Truex, Jr. bumped Dillon a little too hard on a restart. Both ended their days early and with disappointment. However, no one could be as disappointed as Denny Hamlin, who blew an engine while chasing down Johnson. The next two weeks are vital to these drivers if they want to remain in contention for the 2016 Sprint Cup Series championship. Next on the schedule is Kansas Speedway. While competitors like Truex and Kenseth are bound to shine, the handful of desperate drivers will make themselves known. However, the field can’t forget about the No. 48. Johnson is confident his team can build upon this victory – and prepare to fight for the championship.